In 1847 the first San Francisco newspaper the, California Star, was printed in a building on this site. The Chinatown Telephone Exchange started in 1894 began operations in this Chinese style pagoda building in 1909. 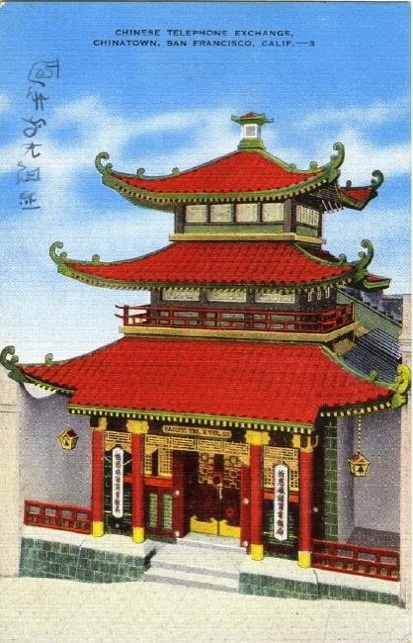 This was the first Chinese style building constructed in Chinatown after the 1906 earthquake. The Exchange operated here until 1949 and was staffed by Chinese women who spoke 5 dialects of Chinese and placed all calls manually. In 1960 the United Commercial Bank purchased the building and opened this branch office. One of the Chinese open style pay phones on Grant Avenue. This telephone was removed in October of 2008. Even the lettering reflected the Chinese character of the booth. A missing poster was posted in its place for a short time in 2008. The last remaining enclosed telephone booth near Jackson and Stockton Street in 2007. This booth lacked the Chinese style lettering. The former phone booth now gives way to a home for pigeons. By 2008 it too had been removed. Just when I thought that all the Chinese theme telphone booths in america had become extinct, I hapend to discover they still existed in Boston’s Chinatown!